Last weekend we had the chance to visit some friends in Logan, Utah. I had never been here before but I was pleasantly surprised at how nice of a place it was. 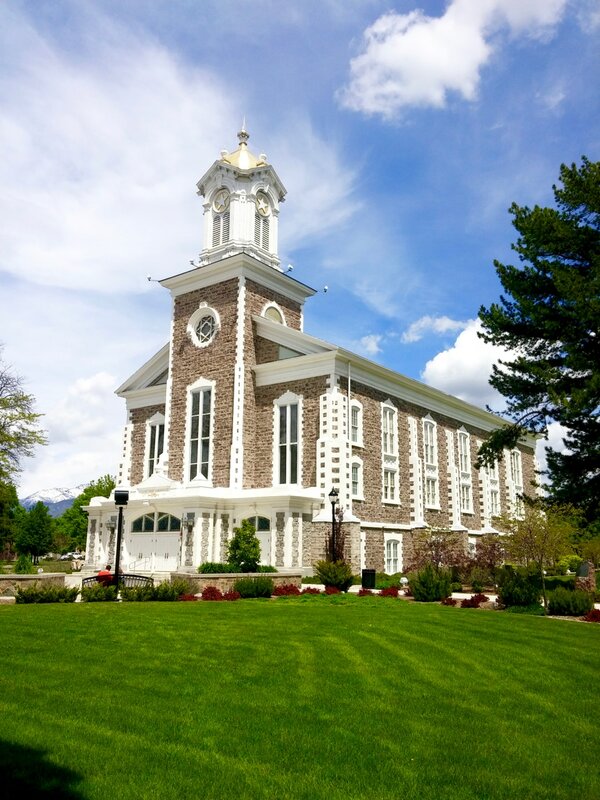 The one building I was most impressed with was the Tabernacle of the Church of Jesus Christ of Latter-day Saints. I knew there was a temple in Logan but I had no idea that there was also a tabernacle. Construction of the Tabernacle started in 1864 but wasn't completed until 1891 because of two delays. The architectural style of the building is eclectic with elements of Byzantine, Roman, Greek, and Gothic styles. There used to be three outside stairways that led to the front doors but they were enclosed by a new front entrance in the late 1880's and the stain glass windows were put in sometime before 1910. The Tabernacle is still used for some church meetings, festivals, and music performances. In the basement of the Tabernacle there is a Family History Center where you can do genealogy work to find out who your ancestors are. We were given an awesome tour by one of the workers in the Family History Center. She was very knowledgeable and willing to take us for a tour even though we just randomly walked in. Official tours start this weekend and will go throughout the summer months. Make sure to grab a schedule there of their summer performances in order to participate in the festivities! Sicily is one of the most amazing places on earth. The history and culture make it full of places to see and things to learn. And that is beside the fact of how good the food is. You'll want to visit just for that alone! Here are 5 places along the eastern coastline of Sicily that you must visit during your stay on this beautiful island. All of the photos in the article are my own. Messina is the third largest city on the island of Sicily. Located on the northeast tip of the island it is known as the gateway to Sicily. It was founded by Greek colonists in the 8th century BC. 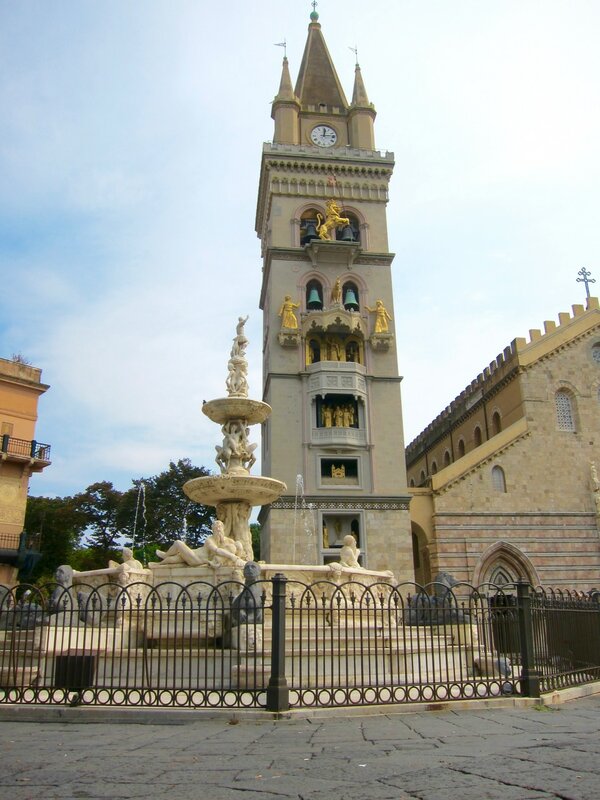 In Messina, you will find wonderful beaches, lovely churches, and some of the best Sicilian food. The granita (especially from “Il Tedesco), and the arancini are the best on all the island (in my opinion of course). Make sure you visit the Duomo in Messina which has the world's largest mechanical and astronomical clock in the world (or as I like to call it, a Cuckoo Clock). Going south from Messina along the eastern shores or Sicily you will come upon a quaint city by the name of Taormina. It is midway between the cities of Messina and Catania. It is most famous for its beautiful beaches and its ‘Isola Bella’ (Beautiful island). It was founded in 734 BC by the Greeks. Taormina has become a very popular tourist destination over the last century. There are many fine dining restaurants to eat at, old churches to visit, and there is even the old citadel on the very top of the hill. 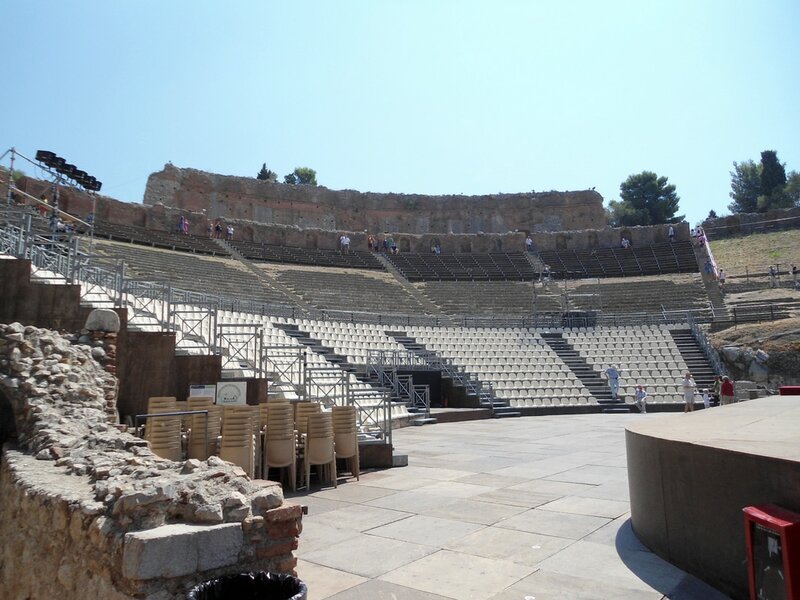 Another one of the main sites in the city is the ancient Greek theater, the Teatro Greco. It is the second largest of its kind in Sicily and is still used today for theater and opera performances. From the theater, you can see our next stop, Mount Etna, an active volcano. Mount Etna is an active volcano on the eastern coast of Sicily. It is the tallest active volcano in Europe at 3,329 meters (10, 922 feet). It is considered one of the most active volcanoes in the world. 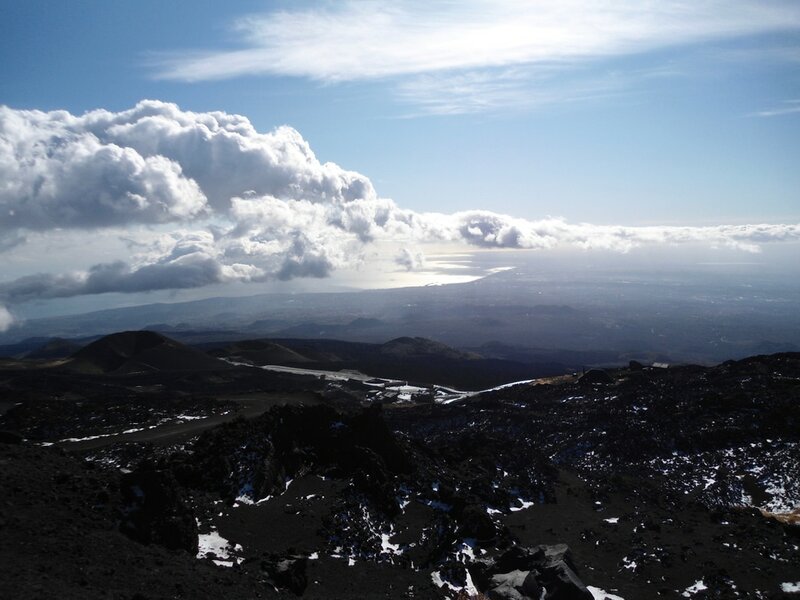 On the volcano itself, you can go for guided tours, ride the ski lift part way up, and visit the many gift shops with different items made from the volcanic rock itself. It is very interesting to walk on and see what a volcano is like. You can then look down and see quite a magnificent panorama of the sea and the city of Catania. Catania is one of the largest cities in all of Italy. 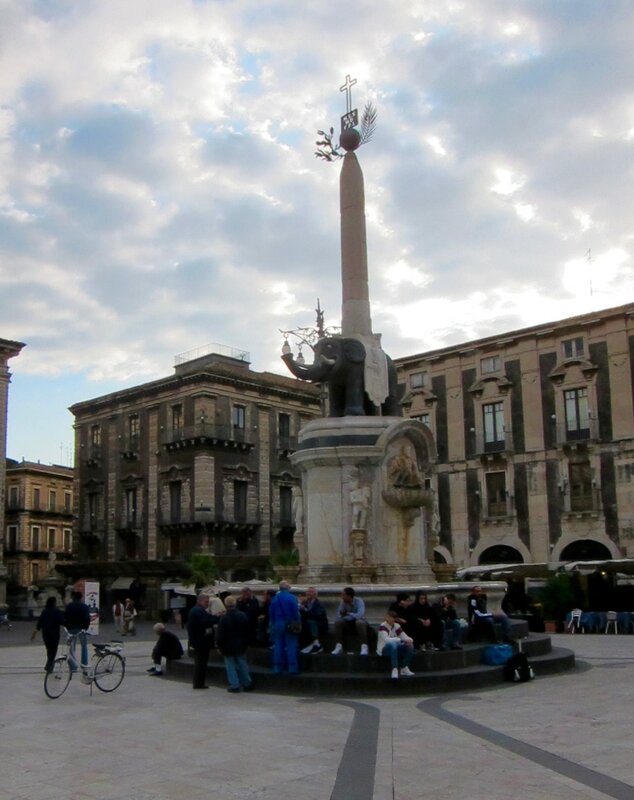 ​Dating back to the 8th century BC, Catania is a place full of history and culture. During the renaissance period, Catania was one of the most important political, artistic, and cultural centers in all of Italy. If you are in love with Italian food, Catania is the place for you to be. The street vendors here are said to be the best in the south. The symbol of the city is “u Liotru”, or the Fontana dell”Elefante (The Elephant Fountain). It is located in Piazza Duomo. Catania has numerous ancient Greek and Roman buildings from churches, amphitheaters, castles, and much more. Syracusa (Syracuse) is originally Greek city that dates back to around 800 BC. It was once known as “the greatest Greek city and the most beautiful of them all” and equaled Athens in size during the 5th century BC. Syracusa now is full of ancient monuments that one can visit. The Greek amphitheater is one of these amazing places. It is the largest in Sicily and is still used today for live performances. There is a temple of Zeus located just outside the city as well. 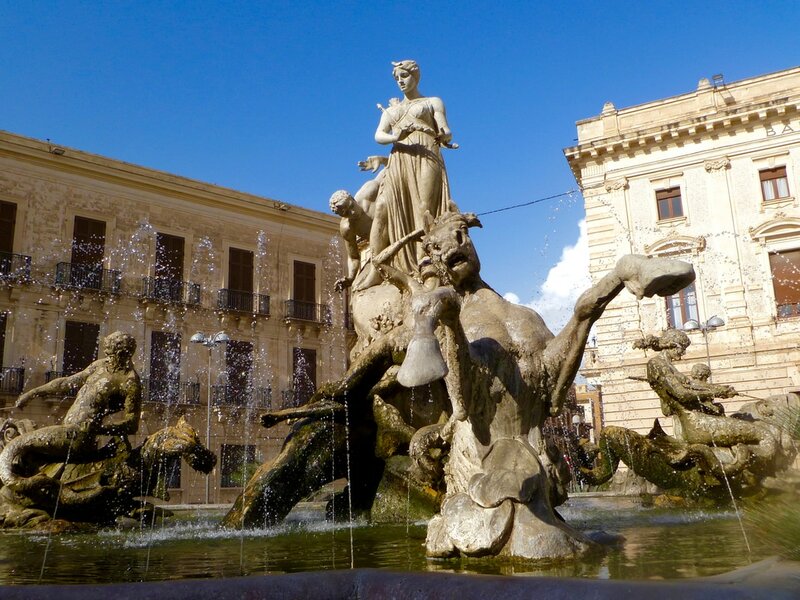 There are many churches, a castle, beautiful piazzas and fountains to see while in Syracusa. And since you are still in Sicily, the food is always delicious! You can take trains from most parts of Italy to Messina and start your journey along the eastern coastline there, or fly into the airport in Catania and start in the south-eastern part of the island. All of Sicily is absolutely breathtaking and a place I would suggest to all to visit. I was fortunate enough to have been able to see a lot of the island while living in Messina. But there are many places I still want to make it to on my next trip there! Taormina is a small city on the eastern shoreline of Sicily. It is known for its great beaches, delicious food, churches, and the famous Greek Amphitheater or 'Teatro Greco'. This ancient Greek theater was built in the third century BC. It is made mostly of brick which makes historians think that is was built during the Roman times but in the style of the Greeks. 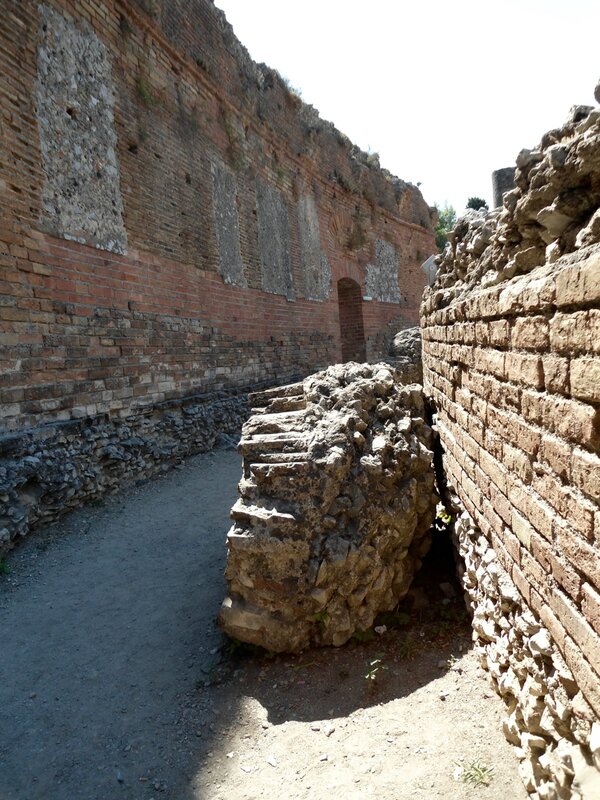 Some think that the theater was just rebuilt by the Romans on top of an older Greek theater underneath. It is the second largest theater of its kind with a diameter of 120 meters (390 ft). The only one larger is a few hundred kilometers south of Taormina in Siracusa. The greater part of the original seats are no longer there, but newer seats have been put in to make the theater useable. The theater is thought to have been able to seat 5,400 spectators in its prime. Live performances are put on at the theater each year. 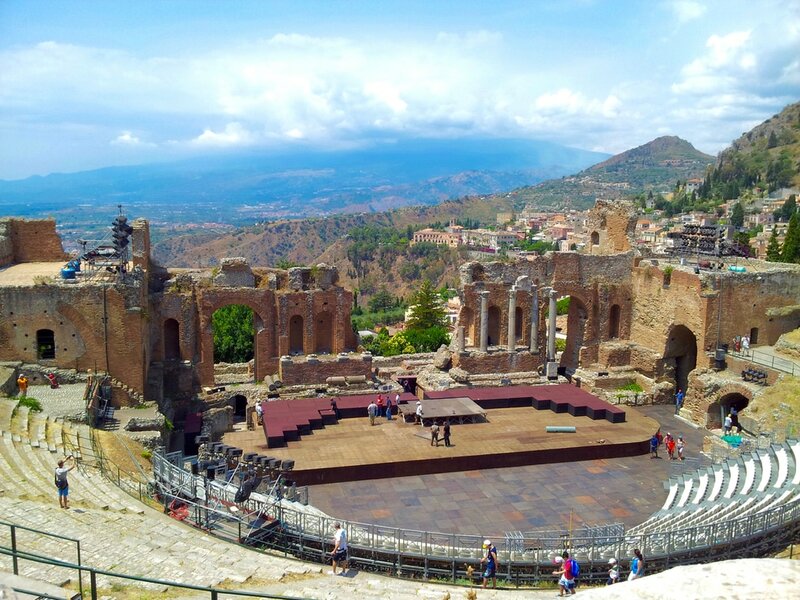 Some of these events include The Taormina Film Festival, the International Plectrum Orchestra Festival, the opera Nabucco by Giuseppe Verdi, and the list goes on. From the theater, you can see the bay in front of Giardini Naxos which has wonderful beaches and is always full of boats. You can also see the volcano, Mount Etna. One can explore above and behind the theater where you can get an amazing panorama of the shoreline going north along eastern Sicily. On a clear day, you can even see the mainland, Calabria. There is a small entrance fee to just explore the theater but it is well worth the price! 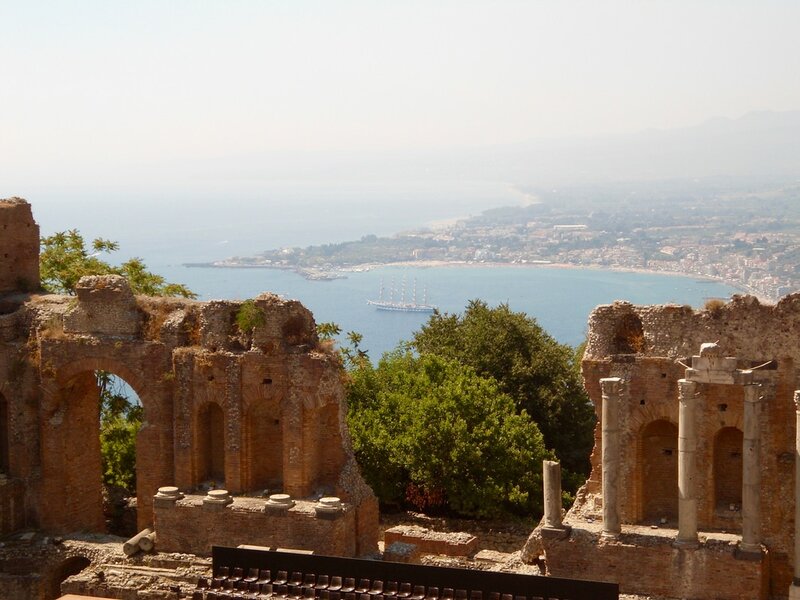 Make Taormina a stop on your trip to Sicily! While I was in Florence a few years ago we only had a few days to see as much as possible. To see the most of the city we tried to find the best viewpoint. 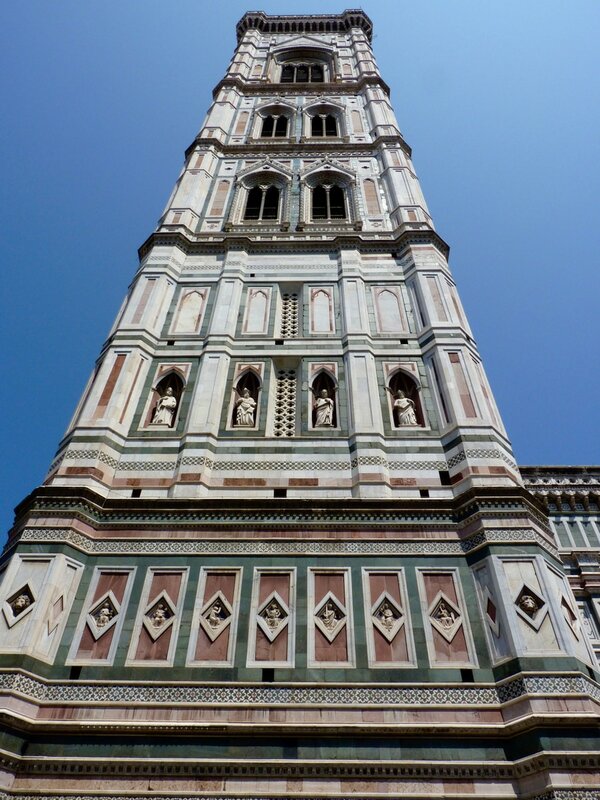 We decided to climb to the top of Giotto's Bell Tower right beside the Basilica of Santa Maria del Fiore. We were not disappointed with the view from the top. It was breathtaking. The staircase going up was very skinny, which meant people had to wait for people going the opposite direction. We went early after it opened so we only had to wait for a couple people coming down. Like everything in tourist-heavy cities, you have to pay to go up, but it was definitely worth it. 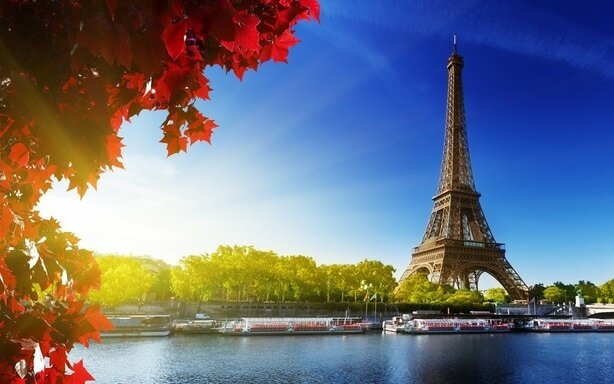 The tower itself stands 84.7 meters (277.9 ft) high. 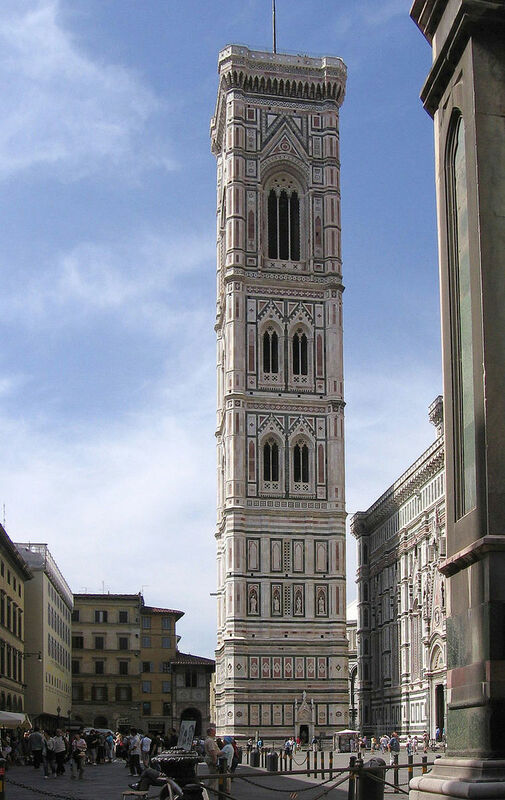 There are seven bells inside the tower ranging from 75 cm in diameter to 2 metres in diameter. Construction was started on July 19, 1334, and it was completed in 1359. There are 414 steps to climb to get to the top. ​Here are some photos from inside the bell tower and from on top! 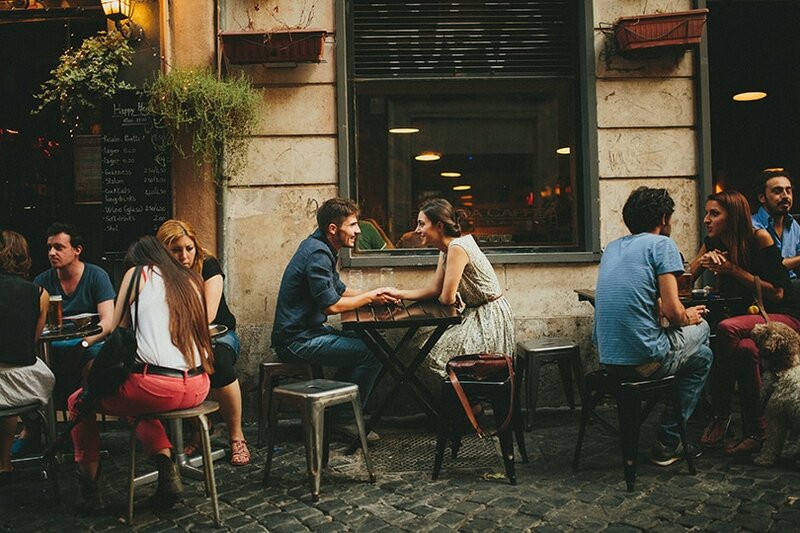 If you have ever been to Rome, you know there is way too much to see and do. 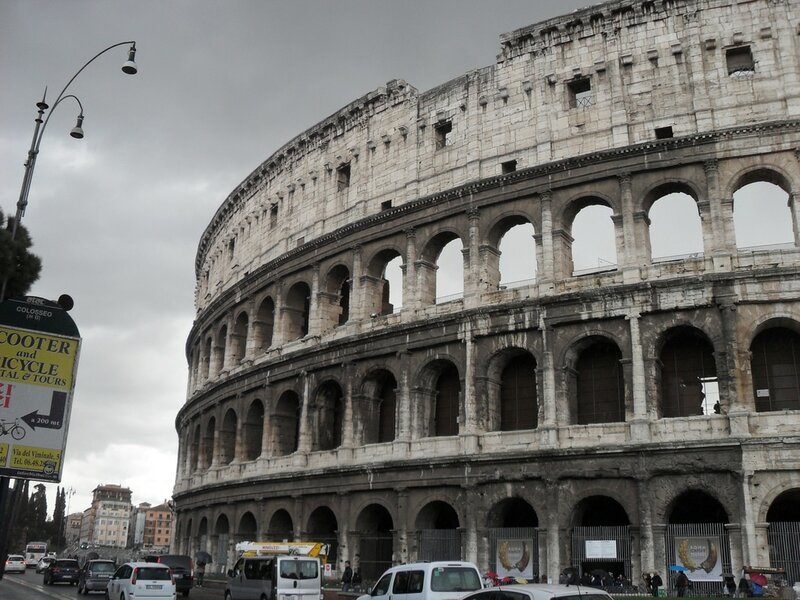 There are amazing popular places such as the Colosseum, the Trevi Fountain, Piazza del Popolo, Castel Sant'Angelo, Vatican Museums, the Roman Forum, and so much more. But I think out of all of Rome, my favourite place is atop the Cupola (dome) of the Vatican! What better way to spend time in Rome than being able to see most of these places from one spot! For only 5 euros one can walk up the hundreds of stairs to the very top of the Vatican. The neat thing about this spot is that you are literally above everything else in Rome. It is illegal in Rome to build a building that it taller than the Vatican, so from this vantage point, you can see everything. You can see St. Peters Square, the Colosseum, the Vittoriano, Castel Sant'Angleo, and so much more. 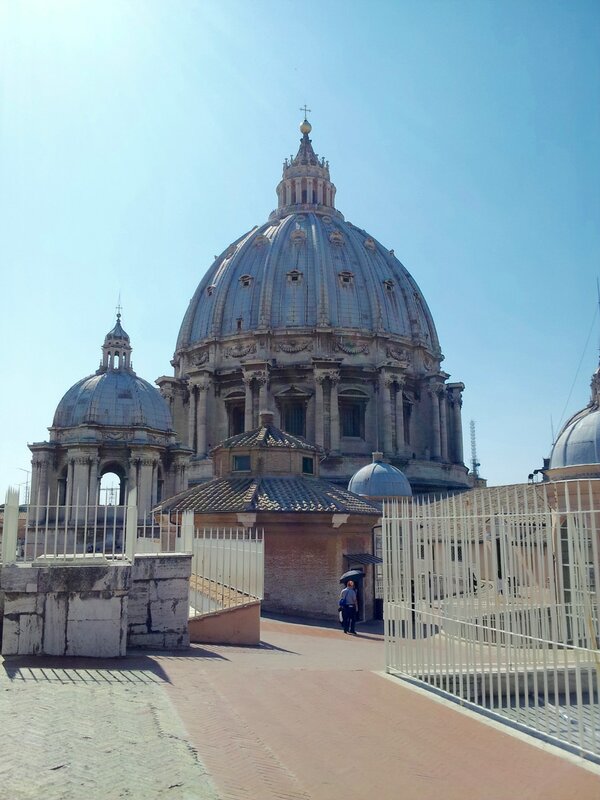 While walking up you will also get a great view of the inside of the vatican from a higher perspective. Here are some photos from on top! 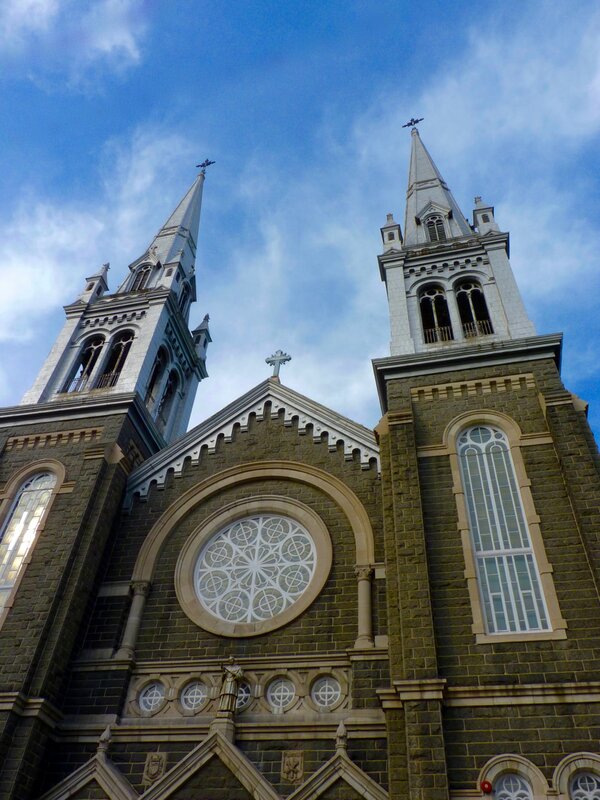 Quebec has a rich history in the Catholic faith. Though many people do not practice this religion anymore, the churches have remained. Some are still used for places of worship, but others have been turned into stores or buildings for others uses. 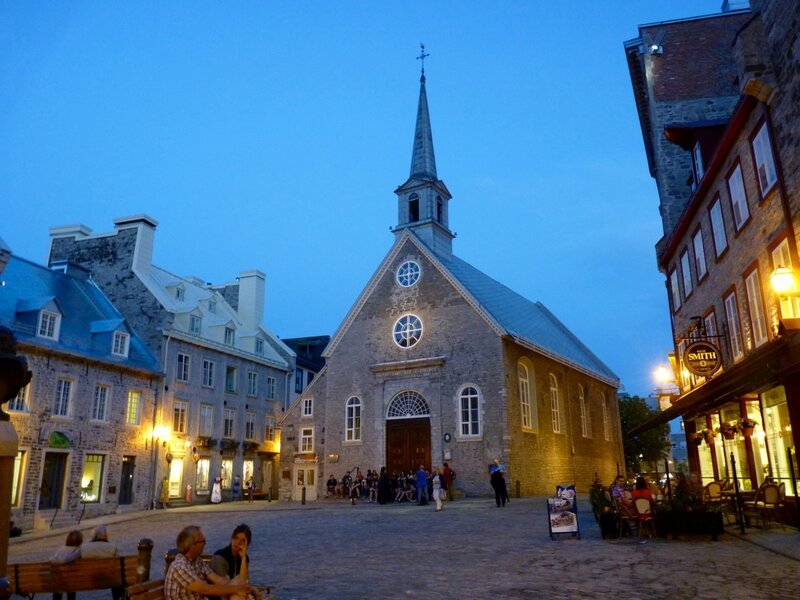 Here are four beautiful churches that you must see while you are in Quebec City! ​L'Église Saint-Roch is modeled after the architecture of the middle ages. It is the largest church in Quebec reaching 265 feet in length and 150 feet in height. It was constructed between the years 1914-1923 in the place of other churches that were in this same spot. The exterior is made of black granite from the nearby river Rivière-à-Pierre. The interior is made of Saskatchewan marble that has visible fossils in it. It can seat 1,250 people in its pews and is still used for worship today. 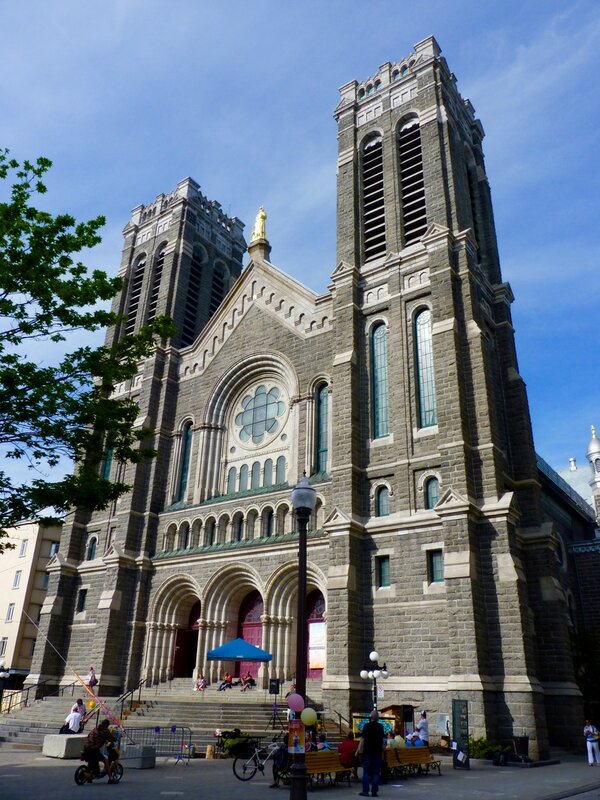 ​Constructed in 1920 l'Église Saint-Charles-de-Limoilou is an immaculate edifice. It was renovated in 1945 but has since closed its doors to practicing religion in September of 2012. 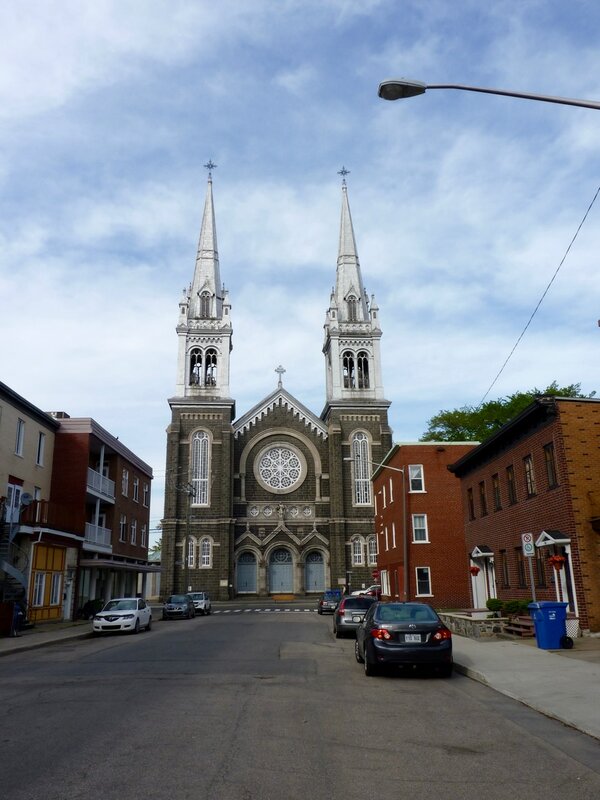 L'église Saint-Charles-de-Limoilou is a part of Vieux Limoilou, the oldest neighborhood, in terms of architecture, in Quebec City. You can see it's spires from many places in the city. That is how I found it. I was up on the hill close to the walls around Vieux Quebec, spotted the spires, and headed towards them! It was worth the walk as that is how I ran into l'Église Saint-Roch! Église Saint-Michel de Sillery was built in 1854. The original building was a sanctuary built by the Jesuits in 1644. 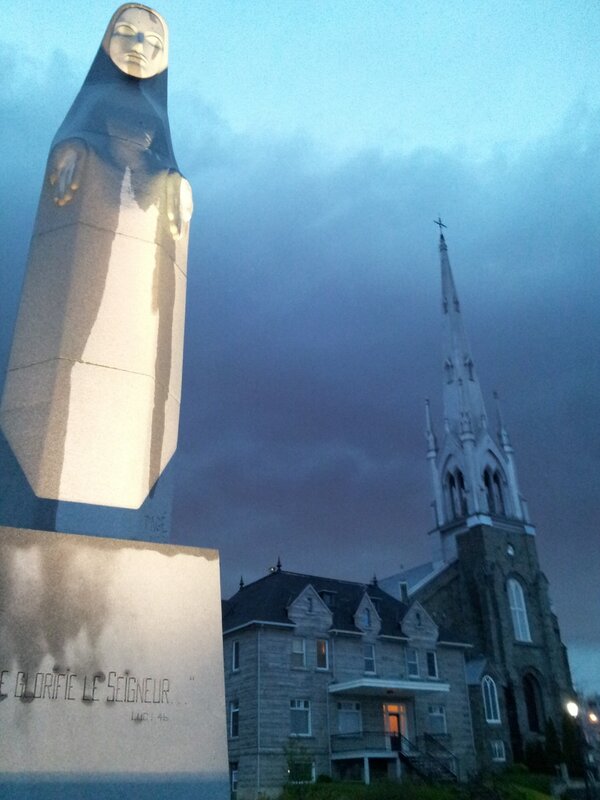 In front of the church are statues dedicated to Canadian Martyrs, as well as a very large statue of Marie-Immaculée. The view from outside the church is incredible. From the lookout point you can see the beautiful St. Lawrence River, the city of Levi across the river, and even down into Old Quebec up the river. It is quite the panorama! 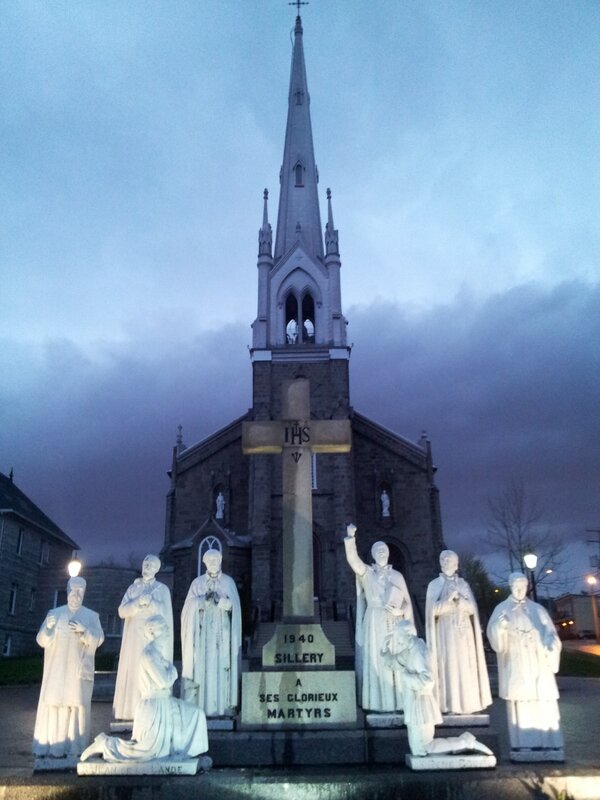 Statues of Canadian Martyrs in front of the church. A sunrise from the lookout point beside the Saint-Michel de Sillery church. Beautiful. 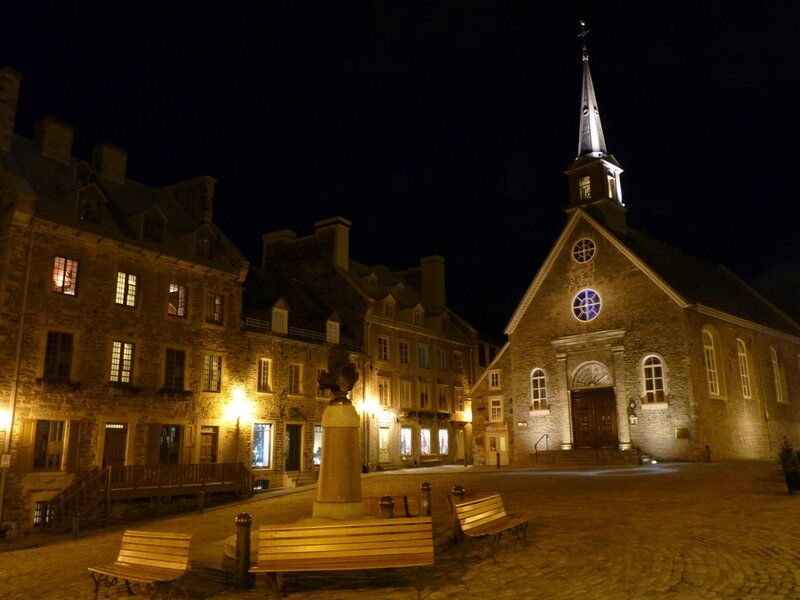 ​Église Notre-Dame-des-Victoires is a stone Roman Catholic church that was built over Samuel de Champlain's dwelling in the heart of lower Quebec. Construction was started in 1687 and was finished in 1723. 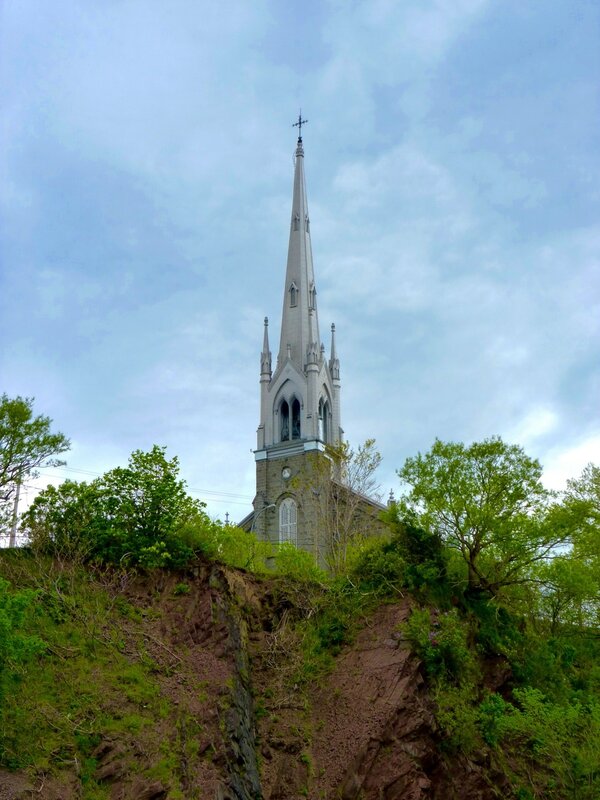 The church was severely damaged in 1759 by a British bombardment that preceded the Battle on the Plains of Abraham. It was restored, however, and re-completed in 1816 and is still used for worship today. The church is used for filming in Catch Me If You Can (2002) and Taking Lives (2004). Just as stunning at night! 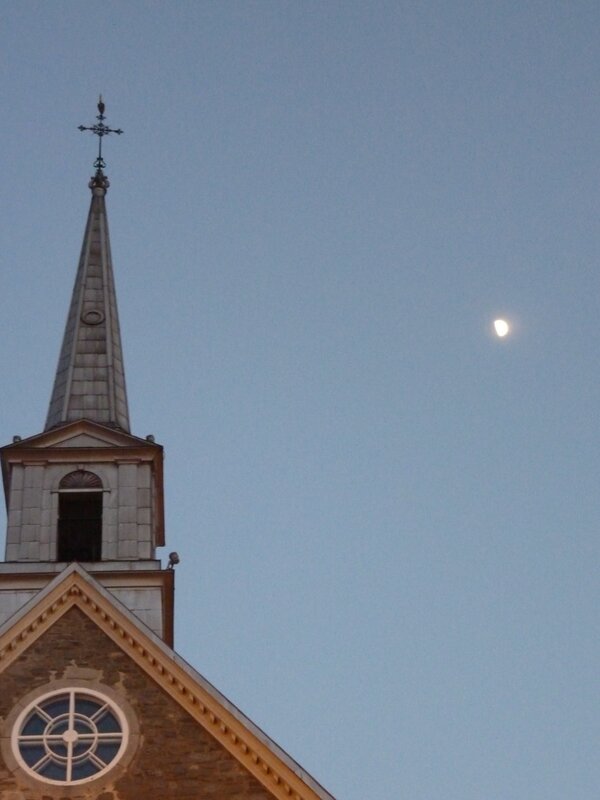 So if you ever go to Québec City, make sure to go for a long walk and you would be surprised how many beautiful churches and other buildings you will find. 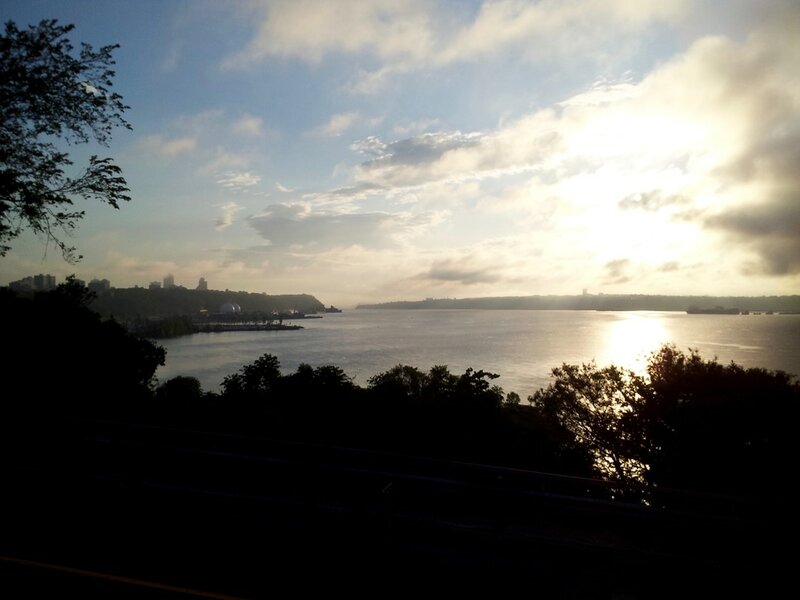 This is just a taste of beauty of Québec City. All the photos in this article were taken by me. Learning a new language can be fun and adventurous, but also very challenging. Having learned Italian and French I have a few tips that helped me accelerate the learning process. Languages are great to have when you are traveling. If you are considering going on a trip somewhere where they speak a different language, take some time to learn a bit before you go. It will make your adventure that much more enjoyable! When I was first learning Italian I would read a few pages of a book or magazine out loud every day. I found this a great way to train my mouth to make the proper sounds and become accustomed to moving in a new way. I remember my mouth getting tired very quickly at the beginning but over time those muscles got use to moving differently and the fatigue stopped. Reading aloud with someone who already speaks your target language is great because they can help you with words you get stuck on, or letter combinations you have never seen. When reading by yourself, you’ll come across letter combinations you don’t know how to pronounce, look it up or ask someone. It is important to try to avoid bad pronunciation habits early on. That being said, do not hesitate to try it before you look it up. Reading is also a great way to increase your vocabulary. Have a dictionary handy to look up words you do not know. I found there were many words I was able to understand just by the context of the story. When I was first learning I had to decide whether I was focusing on my pronunciation or vocabulary expansion each time I read. This is because stopping every sentence to look up a new word really put a damper on trying to focus on pronunciation, so I would pick one or the other. Later on when my pronunciation got better and my vocabulary had grown I was able to do both because they did not each need the dominant focus. There are books you can buy that have one language on one side of the page and another language on the other. This makes learning new words and phrases really easy. Many of them are children’s or young reader’s books but they are still very useful to new learners of any age. I have also used books by "Lire en Français Facile". They are classic novels simplified for learners of that language. They also come with an audio CD so you can listen to someone read the words and you can follow along. This was great for helping me learn how to pronounce words. I will list a few of these books at the bottom of the article. Listening and getting the sounds, words, and phrases in your head of your target language can help immensely. 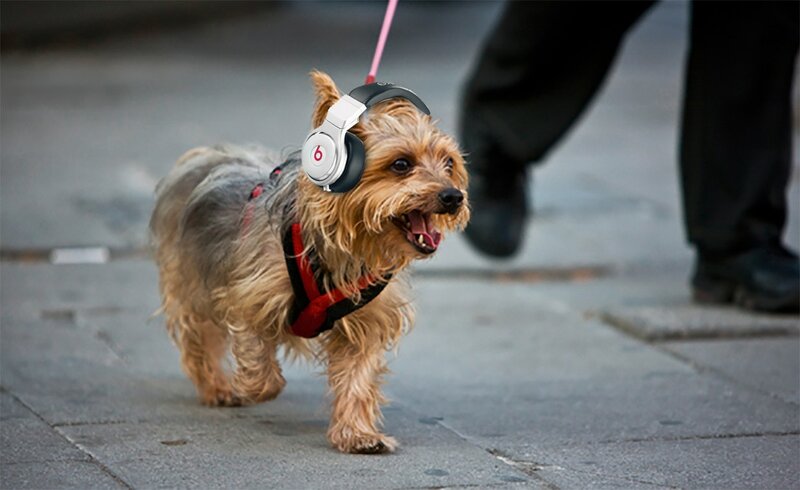 There are many podcasts you can download and listen to on your commute to work, while cooking dinner, on your coffee break (such as the “Coffee Break” language learning series), or while you are taking your dog for a walk. Podcasts are so readily available and come for learners of any level that it would be a shame not to use them. There are podcasts specific for verbs, for vocabulary, and for different circumstances. I now listen to French and Italian news and culture podcasts. It is a great way to learn new vocabulary and hear different accents. Many languages have many different accents depending on where the speaker comes from so exposing yourself to different accents early on is a good thing. Music, though harder to understand at times, is still a great tool to get the target language flowing in your head. If you’re like me, then you like singing to your music while in the car. If you start listening to music in your target language, then you will be singing in it in no time. You may not understand all the lyrics right away but it’s a great way to begin to separate words and work on your pronunciation lyrical style. I love listening to Andrea Bocelli, and I can remember the first time I actually understood the lyrics to one of his songs. I was so excited. Not only was it now helping me learn, it acted as a great motivator and concrete stepping stone in my learning process. I could finally see some fruits to my labors. Listen to music. If you can only pick out a few words at the beginning, that’s great! You’ll be able to learn a lot and feel the joy when you finally understand the whole song! This can be the hardest thing of all. We all have a bit of pride and don’t like to mess up. But when you are learning something new, you’re going to make mistakes. This is the fun of it though. When learning, you’re allowed to make mistakes! Most people just appreciate the effort you are putting in to learn their language. So be brave, and try to speak whenever you can. You may stumble, or not know some words, but you wouldn’t have realized you didn’t know those words, or how to say a certain phrase, if you didn’t just try to speak in the first place. Take note of these words or phrases while speaking so you can either ask someone how to say them, or look them up later. If you are speaking with a native speaker and don’t know a word, try to describe it to them so they can help you figure it out. Being able to describe what you want to say is a great skill to learn. At times though, making mistakes is frustrating and discouraging. There were days while learning both Italian and French in which I never wanted to hear either of those languages again. If that happens to you, don’t worry about it! Take the evening off if you have to, or even the next day. Allow yourself to reset and do something fun in your target language to restart that feeling of excitement about learning again. Whatever you do, don’t give up! If you haven’t already figured it out by now, learning a language doesn’t happen over a day, a week, or even a month. So it’s important to set goals to keep yourself on track. Make sure your goal isn’t just “Learn ______ (insert language here). Make short-term, mid-term, and long-term goals. Examples of short terms goal can include things like reading a page out loud in your target language each day, or writing a paragraph in your target language each day. Mid-term goals could include things such as learning a new grammar principle each week and practicing it, or learning the vocabulary for a certain topic of interest and then using it in conversation. Long-term goals can be more general. Learning all the verb tenses before a certain date (hopefully the date that you are going to that location where they speak that language). No matter what the goal, the most important thing to do is reward yourself once you have reached it. You know best what motivates you, so pick something that will drive you to continue to learn and get better every day. Make learning a language fun so it is something you look forward to doing instead of it being a burden. This is probably the most important tip. That’s why I saved it for last. Nothing can beat actually travelling to a place where the native language is your target language. Textbooks, podcasts, and apps are all great helpers in learning a language, but I believe to become fully fluent you need to become immersed completely into it. A language is so much more than just vocabulary and grammar. It’s culture. How people express themselves directly relates to who they are as individuals and as nations. When you first get to your destination you may be timid to speak because you’re just learning. However, the more you put yourself out there and speak, the quicker you will learn. People can correct your mistakes, you’ll get use to the speed of regular conversation, and you’ll get use to how different people speak. When I first got to Italy, I remember I would be mentally tired at the end of each day because I was trying to learn so much and each conversation took a lot of effort to focus on. Week after week however, I got more comfortable and confident in Italian, and it was taking less and less effort to understand and participate in conversations. One great technique to help you learn is imitation. Listen to the native speakers and imitate phrases they use, how they say things, and their accent. Many areas have their own dialect, or ways of saying certain things. If you learn those words and phrases, and use them, they’ll love you for it. These are the types of things that you can’t learn in textbooks but make you truly fluent. I hope you make learning a language fun. It is such an adventure and helps broaden your outlook on how thinking and processing works. There are certain phrases now that I have to use in another language to truly express myself because it makes more sense than in English. And they say learning a new language decreases the probability of getting dementia, so who wouldn’t want that! If you have any other tips or ways that helped you learn a language faster, feel free to put them in the comments! 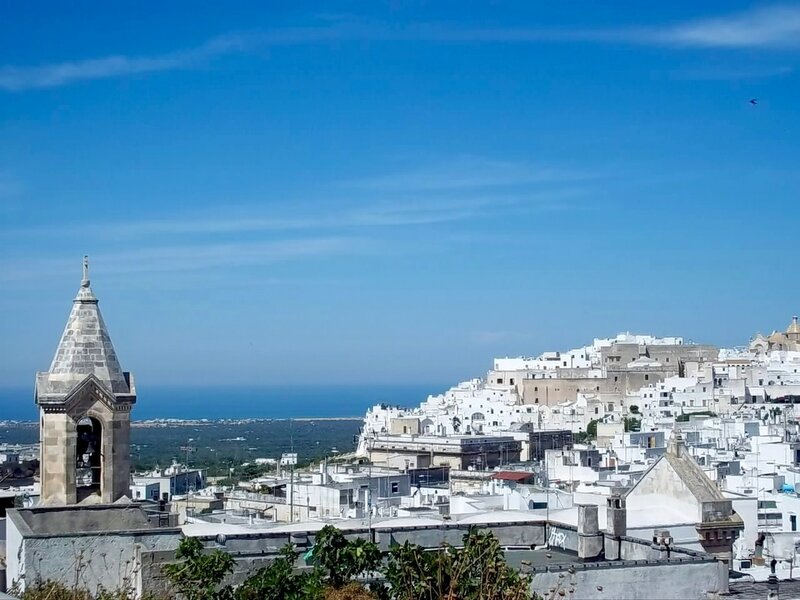 The region of Puglia (Apulia in English, but I will refer to it as Puglia from here on out) is full of so many hidden gems that so many tourists do not know about because they are so focused on seeing Rome, Florence, Venice, etc. Those are amazing places to visit too but down in the south these areas are less touristy which means you will get a more authentic Italian experience. Puglia has some of the most beautiful beaches, and the Italians have done a good job at keeping that fact from many tourists. I lived in Puglia for almost a year and was able to visit many of these places only because the locals told us about them. Here is a list of 5 of these places. However, there are so many more places that I can not fit them all into one post! Here we go with five. Literally translated that is "Beautiful Tree". It is a town of about 10,000 inhabitants and is most famous for its unique homes and buildings known as Trulli. These are the white buildings with the cone top you can see in the pictures. When farmers were settling here they found an abundance of calcareous sedimentary material which they ended up using for Mortar. 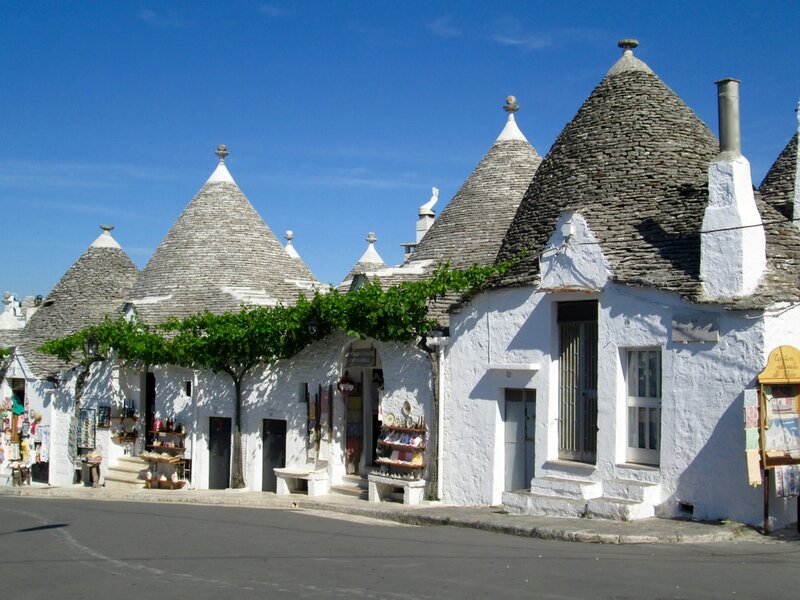 Businesses, lodging, and restaurants now use many of the Trulli in central Alberobello, but there are still many residents who live in these amazing homes. They are built in such a way that the thick stone keeps warm air in during the winter time, and cool air in during the summer time. 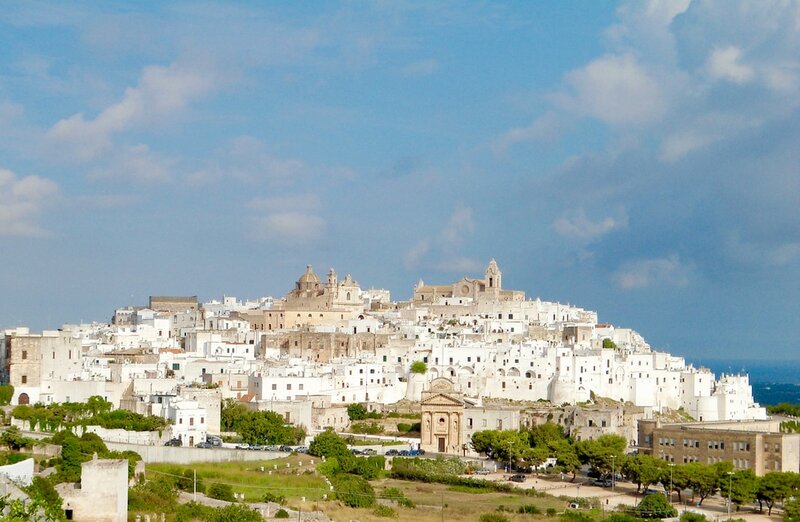 Also known as "The White City", Ostuni is a city that dates back to the stone age. 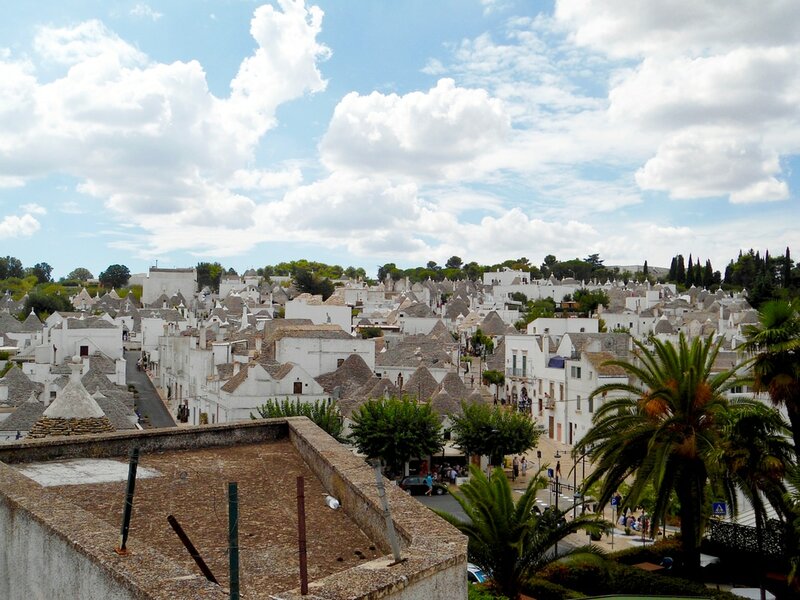 All of the old town has been painted in white. It is quite magnificent to walk around in. During the winter it has around 30,000 inhabitants but during the summer it can have up to 100,000. It boasts many restaurants that serve freshly caught fish from the nearby sea. 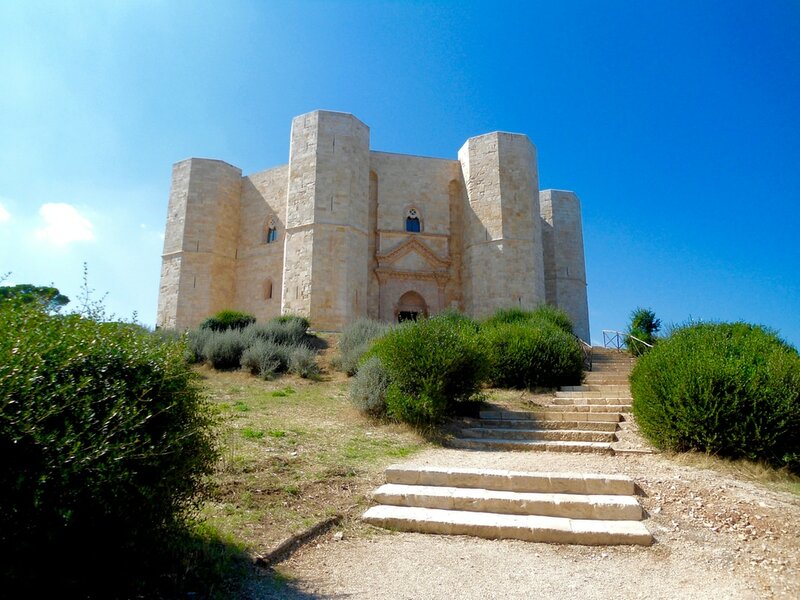 Castel del Monte is a 13th-century citadel and castle built on a hill in Andria. It was built by Emperor Fredrick II after he inherited some land from his mother Constance of Sicily. It has an interesting octagonal shape to it, making it easy to spot and defending enemies from any direction. It even served as a prison at one time as well. From on top of the castle one can see a very long distance. Old Taranto is another amazing sight to see. It is situated on an island with only two bridges leading to it. 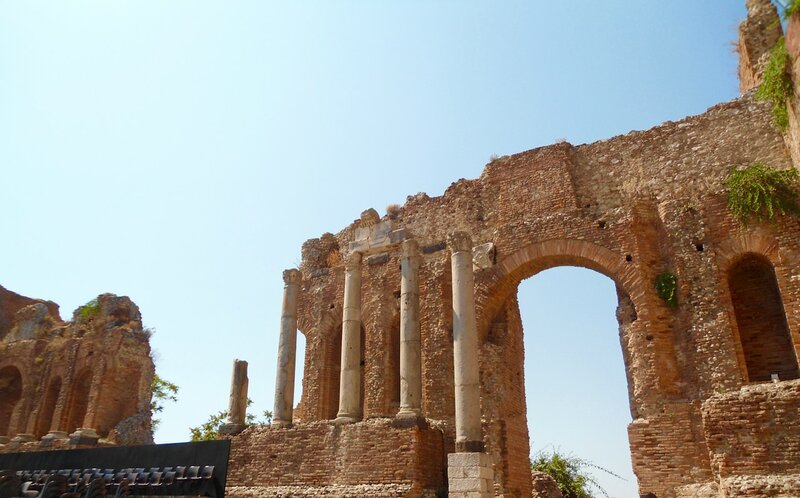 It boasts a large cathedral, an Aragon castle, and other ancient ruins from a Greek Acropolis. 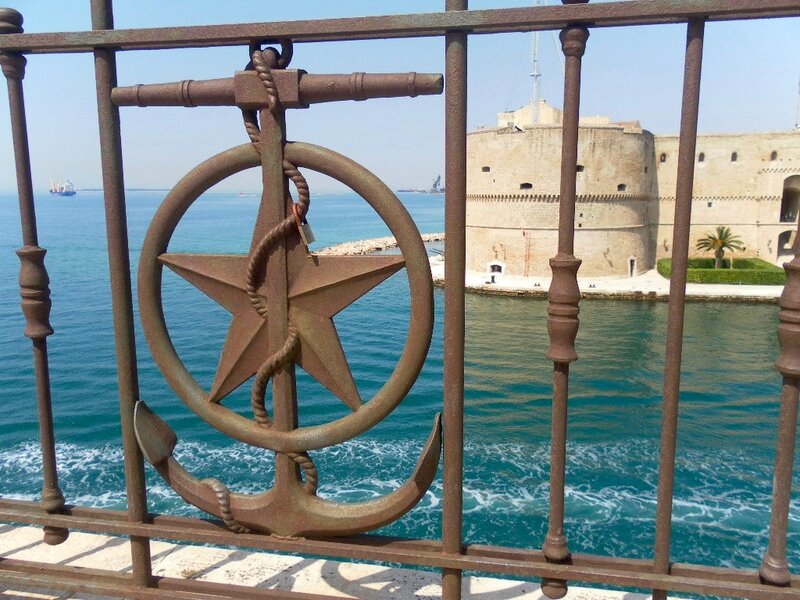 Taranto itself is known as the Spartan City because it was founded by Sparta in 706 B.C. With its rich history, delicious food from the sea, and scenic old town, Taranto is a must. Known as the "Florence of the South". 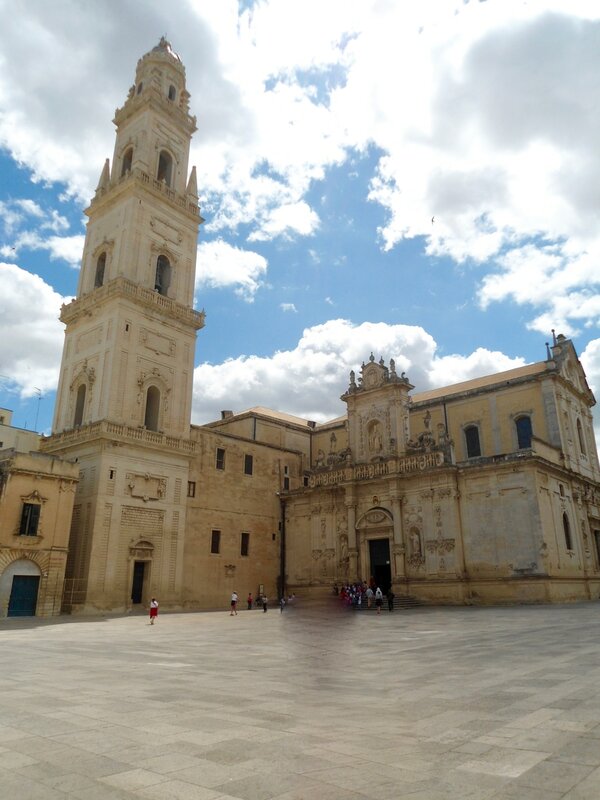 Lecce is a city full of beautiful churches in the Baroque style which give it that nickname. Its history dates back thousands of years just like many other cities in the area and was originally settled by the Greeks, namely Cretans. Some of the main sites include Piazza del Duomo (featured above), a greek amphitheatre, and the Church of the Holy Cross which has animals, vegetables, and other grotesque figures lining the front facade. Lecce is beautiful at every turn. So here are just five places that are beautiful sites to see in Puglia. I hope you get the chance one day to experience them all firsthand! Hey all, Brian here. Welcome to my travel blog. I have had experience traveling around Canada and in Italy so those will be my main topics of interest here. If you ever want to know more about a place, just send me a message and I'll write to you personally about it as well as make a more in depth blog post! Thanks for reading and go travel the world!